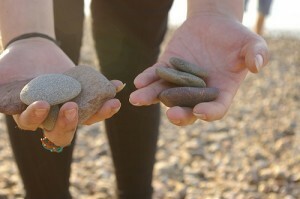 SpaceAgeSage » Blog Archive » Are you just a skipping stone? In a world of sound bites, 140-character tweets, and the rush to attain at least our 15 minutes of fame, Einstein’s words call from another world, another culture, and another time to ground us in healthier ways. A friend of mine thinks that Americans go through life like stones skipping across the surface, never truly plunging deeply into the full, robust, and meaningful depths where Truth, Goodness, and Beauty reside. I think you’re right. We often mistake the latest SUV or the latest gadget or the latest cool piece of the software for the be all and the end all to life, when it’s far from the truth. They say the best things in life are free, and a simple walk in the woods will always carry more lasting, deep value than a mobile phone. But being an American, I’m optimistic we’ll get the message. Well, I can’t speak for Americans. I think it is true for a lot of Canadians. It’s darn hard work digging deep. So much easier to skip across the water. In the short term. Never in the long run. On the other side of the hard work, Truth, Beauty and Goodness are there to be enjoyed. And at that point, it’s not hard work at all. I can’t speak for Americans, too. But I think it is true for a lot of Germans. As the Urban Panther already mentioned, digging deep is hard work. ‘American’ and ‘optimism’ do go together. I think there will be a pendulum swing toward those walks in the woods, too. Hard work, yes. Just like exercise, it’s good for you, but oh the initial workouts and staying power needed! But then, when the stamina builds, it’s soooo much easier. I would think Germans would have this down pat! Perhaps it is a worldwide thing. And then there’s Twitter hogging our time, too. Part of the organizational info boom seems dedicated to separating urgent action from meaningful action. Seems we want to go there, but what does it mean if we have to plan for something that in the past was a natural part of our culture? As an American artist/photographer and writer, I have taken the plunge to go deeply into my creative self. As I hibernate within, I find Truth, Beauty, and Goodness residing there and so many other treasures. I tend to be a nature person anyway and often find refuge in Woods. I think Change is coming to America, the energy is shifting in a positive way, and the reverberations are being felt everywhere. This is my first time to your site, I love your thoughtful words and photos and will be back. I welcome you to my blog if you feel so inclined! I leave here with much food for thought. Hi Lori. Absolutely the truth! This is a great analogy. We do have our shovels though, and we dig from time to time. We’re on our way. You’ll never know what you will find under a skipping stone — unless you turn it over. I think we should pick one or two areas of life in which to go in deep, and then skip stones on everything else. Nature does have a way of resetting us, doesn’t it? Plunging into the creative self seems like an interesting journey — glad you are on it! It’s interesting to see what people choose to go deep on, yes? Butterfly Woman showed me your website and I am impressed. Great job. I think I agree that Americans in general are preoccupied with material wealth but it is my experience that nearly everyone I talk with would rather talk about the things Einstein mentioned (Truth, Beauty, Goodness) but they think most people don’t want to listen to that type of talk. For some reason, (I have never figured it out), people do not have that problem with me – they share their inner most thoughts even if they are meeting me for the first time – it must be that Talk Deep to Me T-shirt I wear. Keep up the thoughtful blog. I am an Indian (the original version, not the Red variety!) so, I would not like to comment on Americans. This statement can be applied to everyone everywhere. This is the problem today in the world. Not enough depth to anything and a lot of superficial preconceived values and prejudices ruling all our action. There is so much of shooting from the hip reaction and enough action. I have no choice about going deep…if I get to busy during the day my mind takes its processing/reflective time at night. It runs the show, and I’m happy to oblige it with plenty of moodling time. Sounds like that t-shirt is working for you. *smile* It’s nice when people feel that comfortable with you. My husband has a similar ability to start up conversations with strangers and leave them smiling. Yes, the difference between reaction versus response is a big one! Response requires more depth than a knee-jerk reaction. “Moodling time” — cool phrase! I’ve never really noticed how day versus nighttime processing goes on for me — I’ll have to pay more attention. A skipping stone is a good analogy — I haven’t heard that one before. I do think that for all its complexity of being an immigrant nation, Americans like to oversimplify things. Just like your post on good vs. evil, it always seems to be about polar opposites — left vs. right, liberal vs. conservative, black vs. white. In truth, few countries are as diverse, complex, dynamic, and messy as USA.